Surgery News & Resources - Robot Surgeons: For Prostate Cancer & Gastric Bypass? Robot Surgeons: For Prostate Cancer and Gastric Bypass? 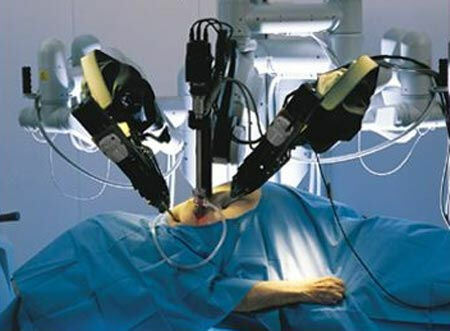 07 February 2006 - Robot Surgeons: For Prostate Cancer and Gastric Bypass? Robotic surgeons may seem like science fiction, but they are routinely helping human surgeons perform surgeries across the world, especially North America. Prostate cancer surgery is benefiting immensely from robotic surgeons, since the robots can be more precise in nerve-sparing, allowing men to retain important functions of elimination control and sexual performance that can easily be lost during such surgery performed by a human surgeon. At the USC Center for Pancreatic and Biliary Diseases, surgeons perform increasingly complex procedures on the liver, pancreas, and associated ductal systems. Pancreaticojejunostomy and the Peustow procedure (suturing the jejunum to the pancreatic duct to provide drainage of pancreatic juice into the intestine in patients with obstruction of the pancreatic duct). The first generation of surgical robots are already being installed in a number of operating rooms around the world. These aren't true autonomous robots that can perform surgical tasks on their own, but they are lending a mechanical helping hand to surgeons. These machines still require a human surgeon to operate them and input instructions. Remote control and voice activation are the methods by which these surgical robots are controlled.
. . . In robotic-assisted surgery, the da Vinci robot is an extension of the surgeon’s hands in a way not previously possible with minimally invasive surgery via laparoscopy, he said. As in laparoscopy, robotic surgery involves small incisions of one-fourth to three-fourths of an inch, into which sleeves are inserted as ports for placement of specialized instruments and a video camera. “Robotic surgery allows us to virtually place our hands inside the patient without the need for large incisions,” Boggess said. After sleeve placement, the robot, much like a post with three arms, is wheeled over and its center arm docked to a port that holds the camera and the other arms docked to the instrument ports. Another advantage with da Vinci is the elimination of tremor. Surgeons can scale, or ratio, their finger movement to that of the robotic instrument. A movement of inches at the console can be scaled down to centimeters in the patient. So even a surgeon with a tremor can perform flawlessly with the da Vinci surgical robot. The robot is actually an improvement in many ways, on the natural human surgeon--but it depends on the human surgeon. It is an augment, not a replacement. These machines are quite expensive, and still experimental for many procedures. Nevertheless, in settings where medical provision is by private pay, these machines should gain in use. In settings of government provided medicine, the machines will take much longer to attain wide use, due to cost constraints. Eventually, cardiothoracic surgeries and intracranial surgeries will be done routinely by robot, due to the delicate nature of those procedures.